Let me just preface this by saying, I absolutely love the look of this phone. Call me old fashioned or even totally crazy but I just love me some Nokia E73 goodness. Tried and true Nokia still makes some of the best looking phones on the planet. Perhaps they aren’t the most feature rich, or the most up to date but Nokia has been a staple in my phone lineup since my very first phone. With a rumored June 16th release date right around the corner we’re hoping this phone might sway some of you who are still on the fence about Android, can’t find yourself owning a Blackberry and will take a phone that might be a little dated, but works like a charm. Any takers? ← T-Mobile Next U.S. Carrier To Get iPhone Love, Not Verizon? Hey David, did you confirm if $10 phone first web will be sufficient for this or we need smartphone data plan? Yuu said once in a previous post that phone first data will be fine, but another user reported that they twittered tmobile and tmobile said $30 data required. I was talking to T-Mobile about the Nokia nuron and that had the $10 phone web fist or what ever it is called so I would think that it would work with this too. Really can’t wait to pick one up next week. Wonder what the full retail price is going to cost me? $30 smartphone web will be required if you upgrade. It’s considered a smartphone! Also notice the phone has a front facing camera as well and it does do video calling. I would get this phone with a $10 data plan. I will not get this phone with a $30 plan. I am sure I am not alone. Give me that e73! is the build quality the same as the other e78 models? Nuron was a smartphone but didn’t need a 30 dollar data plan. Web2go was sufficient. Nuron is NOT a smartphone. Nokia said so themselves thus the reason for the $10 phone first web. Funny because the phone runs s60 here did you see this? Also T-Mobiile said it is smartphone, and I used it and it has the s60 features. It also has a front facing camera, wonder if T-Mobile will be launching a video call service soon? Samsung Galaxy S also has a front facing camera. Hmmm…. 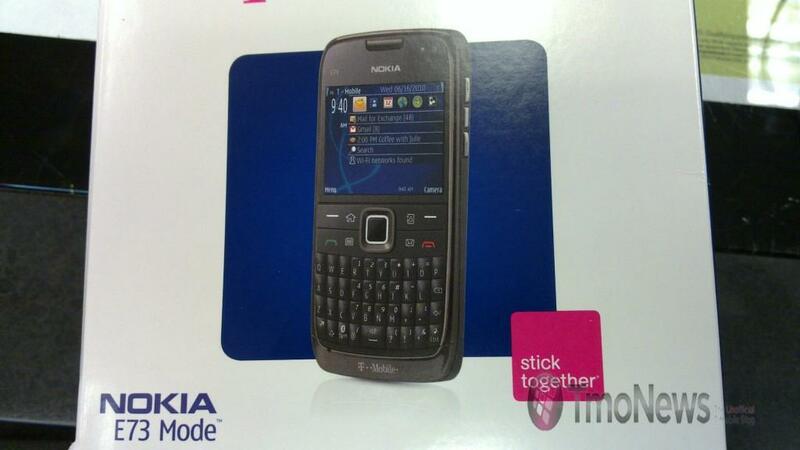 Wow, this looks like a great smartphone addition for TMO. I’m an android fan but I showed my sister this phone today and she absolutely loves it and wants it. I think for the person who’s not into blackberry or android this will be the perfect phone for them. It will be a great seller. Can someone confirm $ 10 data plan is enough? That’s a deal breaker. E73 will be required $30 or $25 data service. that thing looks EXACTLY like the Motorola Q that was released by Verizon back in what….’06?! USB/microUSB charging on a Nokia? I must be missing something… I decided a long time ago that I wouldn’t buy a phone without a USB (now microUSB) charging system, whether it be for myself or a loved one. I’ve always had a softspot for Nokia, but they’ve missed out on years of my business due to proprietary chargers. Now I’m all about Android. Come on, Nokia. You know what we want. This phone would have excited me 2 or 3 years ago. Now, it makes me say “meh” and love my Cliq and MyTouch Slide even more. Gotta love Android!! If the Dash 3g, Behold 1, Memior, and all those lame handsets require a full data plan, guess what, so will the e73. The phone does VIDEO CONFRENCE CALLING WITH THE FRONT FACING CAMERA!!!! And it is the $25 or $30 web. It’s a full HTML web browser, not like the Nuron. And has a bunch of features loaded inside! have you tested it out? All nokia e7x phones does video calls. It all depends on the carrier for it to work. Considering nokia made this phone for tmobile, I wonder why they bothered making it this way unless tmobile is able to do something that att can’t! @ Riopato T-Mobile does have too many phones on it’s network and they put the front facing camera in this phone because that is the cool thing to do now in the US. front facing camera works great, it will be the “smartphone data package” and will be $70 after a MIR. Its really nice, I enjoy it a lot and provides a nice blackberry alternative that phones like the DASH tried and failed to do. its REALLY thin, great build quality 1500MaH Li-PO battery, awesome battery life, micro usb charger (the 3 upcoming samsung phones-gravity 3, t, and :) all have micro usb chargers as well!!). U can adjust the sensitivity on the optical pad. Once that is done, it actually performs better than a BB 9700. As for the UI, it could have been streamlined to look better, especially when browsing the web. Cant wait to see the Video Call in action! Just a FYI, i too have a N1 but i am thinking of getting this as my second phone. I heard (read) it requires a $30 data plan (unfortunately).